I have not done anything up to this point. This article has me thinking now. Not sure if I am doing enough. I have been wanting to get one of these. Thanks for the opportunity. My air purifier has bit the dust. So in order to have at least a bit of air purifying, I have added green living plants to the living room. I also vacuum more with a hepa filter vac, and dust as often as I can. As well, to cut down on dust and allergens, I wash everything with an extra rinse, and use only natural , free of dye and scents laundry detergents. This would be such an extremely appreciated healthy living product for our home. I have an air purifier in my living room, but I could use one in my bedroom too! Both my husband and I don’t smoke. I use essential oils to freshen the air instead of aerosols. I can’t really do much because of my asthma but I try to use natural products in the home. I run two small air cleaners one in the bedroom and one in the living room. By using an air purifier. I am dusting more and keeping all containers clear and clean. Windows closed and keep my fingers crossed. I try to dust & vacuum as much as I can to make the indoors more allergen free. 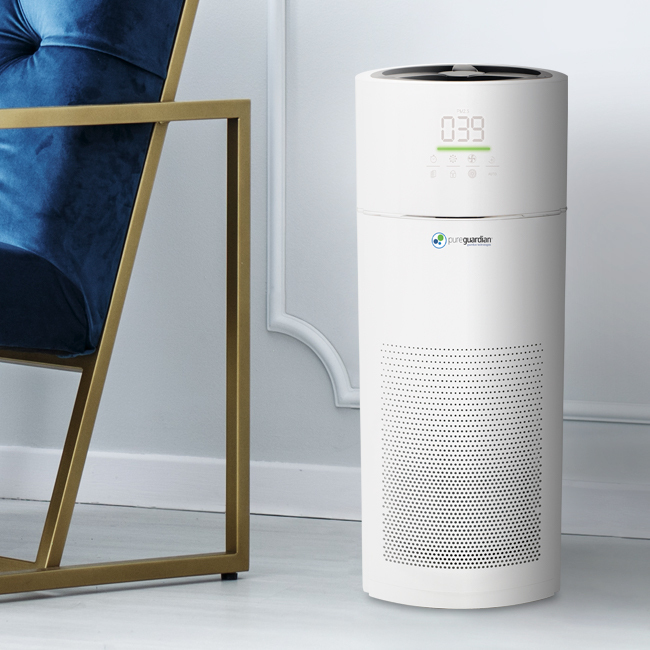 This air purifier would really keep my apartment clean & combat pollution. I am allergic to so many things! Thank you. I talked with the person I live with, and it became kind of embarrassing to realize that we really don’t do anything– all we could think of is putting the standard filters on the furnace. However, neither of us smoke, so we have eliminated that source of pollution. Also, over the past year or so we’ve switched almost exclusively to non-toxic household cleaners. I do most of the cleaning around the house, and I try to keep on top of cleaning the areas that can be easily forgotten. Like others have commented, this post has gotten me thinking– thank you! I cleaned my crawlspace and encapsulated it. I also cleaned my ductwork. Air quality has drastically improved. I have not done anything other than cleaning. I have been trying to figure out something because my indoor allergies seem to be getting worse. We have an air scrubber as part of our HVAC system. oils, house plants and open windows. I try to dust and keep the windows open. I have air purifiers in my living room and bedroom but they are old and need to be replaced. All i can do is clean.dont know what elese. I am not actively doing anything for our air quality in my home right now. I was just recently thinking we need to pick up an air purifier and this would be perfect. I haven’t done anything at the moment, but would love to. We do have an air purifier for my daughter that has immunodeficiency disorder & allergies. It is in her room, but I would love to have one in our living room/dining room area as well so she (as well as our whole family) can have the benefits throughout the whole house! We use a Living Air purifier. I haven’t done much except try to air it out once it awhile. Downstairs I have baking soda and epsom salt with carpet deodorizer placed around to combat mildew. I keep the house clean and uncluttered and as dust-free as possible. I am lucky enough to live in Florida so my windows are always open. I have been looking at air purifiers for sometime now but haven’t made up my mind what to get. Therefore this post peaked my interest and I am going to look into this one. We buy an air filter that controls air pollution. I try to keep up with changing our filters. We keep our windows closed and the air conditioning on when it is allergy season. My cat and I both, have allergies so I removed all rugs and carpeting, it helps a lot! We are using a Honeywell air purifier. We try to keep the house tidy and we have a nice oil diffuser in our livingroom to keep our home smelling fresh. It would be great to add an air purifier to help with allergens. I haven’t done anything yet other than keeping the house clean. Currently, we are using premium air filters with our HVAC system and changing them regularly as per the manufacturer recommended intervals to combat indoor air pollution in our home. I guess nothing but changing the filters. I use an essential oil diffuser. I love my diffuser.